This is the long awaited alpha build for Snakeoil - Blind Testing. The music players in this release are the same as that from 1.0.8. Almost everything else is different. Blind Testing is now built using a new Angular 5 framework called ngx-admin from Akveo. Note that there are a lot more blank spaces around the WebApp now. That's by design as ultimately this page is supposed to be viewed from a tablet device. Another thing you might have noticed is the firmware files are now smaller - much smaller. The WebApp is overally more responsive too . Before we celebrate, please know that right now this firmware is currently considered unstable. There could be problems as there are a lot of new features and changes. Although I need people to test this firmware, please try this firmware only if you are relatively comfortable with computers. It should also be safe for you to roll back to Golden Ears if you want. You may need to refresh the page multiple times to clear any old cache with this upgrade. Just keep pressing CTRL+F5 or SHIFT+F5 until this page shows up. There are a lot of new features in this alpha. You can find out what the changes are by looking at the 1.1.0 roadmap. You can also check out the new WebApp online. Items that have been crossed out (crossed out) means they have been implemented. The other items are still unfinished. This list is dynamic. Bugs can be added as I found 'em, and features will be added/removed based on my available time. A lot of the features are not documented in the Snakeoil manual yet. But I hope they are intuitive enough for you to understand what they are. Please post in this thread if you have any comments or issues. Lastly, I still need about 90 subscribers and 4000 views for my YouTube channel. This is still a big hill to climb so I appreciate all the help I can get. Please let your inner circle know about Snakeoil, and encourage them to try out the software. Don't forget to ask them to view the lousy videos and subscribe to the channel. There are some things I can't do without getting those numbers (e.g. add a card into my video). So appreciate every subscriber/view I can get from you guys. My last video has earned 7 thumbs down because I can't add text into the video . Without further ado, here are the firmwares. Webapp came up first time. That is as far as I have got so far....stopped to listen....mpd and ympd ! Now all I have to figure out is how to have the station and track info displayed in ympd... currently when a station is selected the track info replaces the station info and does not update so once you move to another station or several moves the list is simply static tracks with no station identifier. Must be a refresh button somewhere...I'm off to look.. Here is the view in ympd and cantata. Cantata shows track and station. ympd shows track only and the navigation header is static from the first track played. I think this is ympd as I have seen the behaviour in other players. I will contact andy at ympd and see if there is a fix. I wonder if he's still developing it. I'm using GIT head, and no commits since Feb 2016. But lets wait and see if he'd get back to you. Just downloaded and installed. That's great achievement! Faster, and believe me or not, I feel that sound improved significantly. of course MPD still best SQ, however its GUI still not "user friendly" =). Still my dream is to see MPD in Roon as a networked "device", as it is possible with HQPlayer. Any new tweaks available for this version? Dark skin for new Snakeoil is less pleasant to my eyes then previous. There's a reason why the SQ has improved. But suddenly I can't remember what it is. Hopefully it'd come to me eventually and I'd note it donw. of course MPD still best SQ, however its GUI still not "user friendly" =). Still my dream is to see MPD in Roon as a networked "device", as it is possible with HQPlayer. 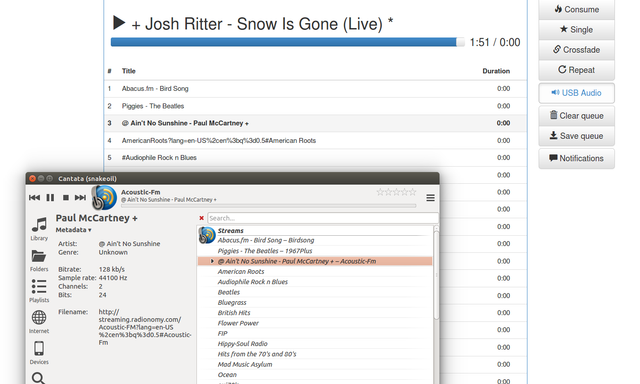 If Roon works with uPNP you can try upmpdcli option? It turns MPD into a UPNP renderer. (29-Jan-2018, 01:00 AM) Dmitry Novikov Wrote: Any new tweaks available for this version? Yes. In the snakeoil menu yoou can power off unused USB ports (not all USB hubs will support this though). There are some additional stuffs that havn't made it into this alpha - CPUSET. hopefully I can finish that soon. (29-Jan-2018, 01:00 AM) Dmitry Novikov Wrote: Dark skin for new Snakeoil is less pleasant to my eyes then previous. thanks for the feedback... I'd try and adjust that for the next release. Unfortunately it does not, however Jussy Laako(HQplayer) somehow managed to let roon to recognize his player. I just surprised why nobody till now not did same for something less recourse-eating and a bit more transparent than HQplayer=). Also will wait Armv7 version of Snakeoil with great interest! (30-Jan-2018, 01:41 AM) Dmitry Novikov Wrote: Unfortunately it does not, however Jussy Laako(HQplayer) somehow managed to let roon to recognize his player. I just surprised why nobody till now not did same for something less recourse-eating and a bit more transparent than HQplayer=). Also will wait Armv7 version of Snakeoil with great interest! I think you are on to something there - MPD with Roon will be a great fit. I'd research a bit and see what can be done. 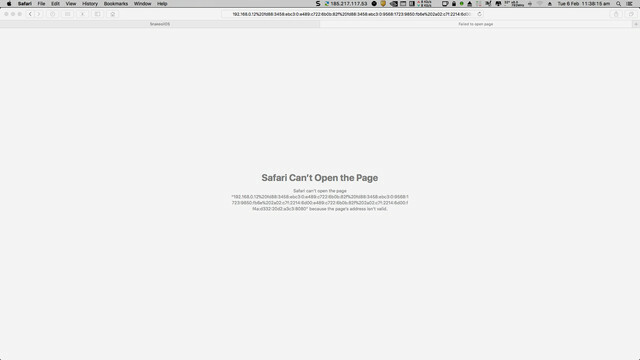 YMPD is not working in Safari, I have added a screenshot. That's a bug where snakeoil OS can't find the IPv4 address properly. I'd see if I can get up a quick fix later today. In the meantime, you can stip off the text starting from %20 and the IPv6 address, and it should work. Installed and working fine. Not sure about the USB management; think it is not working for my system. I see my DAC (USB via PCIe) and a couple of USB hubs/devices that should not be in use. I also see "SNAKEOIL.MANAGE_USB.NO_DEVICE". Am I supposed to leave that ticked or untick it? When I untick devices, they might seem to disappear but when I leave the Snakeoil tab and return to it, everything is there and ticked again.